The educational system is always under debate and one of the hottest topics could be the standardized tests. With many parents disputing the idea of “standardizing” knowledge and education when all children are so different, there are many benefits to the standardized tests that keep them relevant and a basic requirement for college. Some of the many benefits includes the objective way to measure students fairly across the board, the proven track records around the world, and tool to push students and teachers to reach a certain level. Computerized system leaves no room for gray areas. In some educational situations, subjective opinions come into play and can be considered unfair or arguable. With a black and white standardized test there is no gray area. Questions are right or wrong and graded by a computer (aside from any essay portions which are graded separately and dealt with in a different manner). This creates clear guidelines for everyone to follow and adhere to. Speaking of clarity and objectivity, the computer-grading system also allows for another enormous benefit. The standardized tests are non-discriminatory as they are a one-size-fits-all deal. So no matter what the test-takers’ background or what part of the city they live in, these tests are mandatory for everyone and consist of the same materials. When looking at things like college acceptance, it is critical to have this neutral option to measure prospective applicants from very diverse backgrounds fairly across the board. Despite the many arguments that surface regarding the standardized testing system, these exams have a proven track record nationally as well as around the world. A lot of countries like China who excel academically have standardized tests implemented in their school systems. Perhaps the reason countries with standardized tests have successful academic programs and school systems is because they set a standard. These exams lay out expectations for students to reach and create a guideline for teachers to instruct with. For the areas with these particular exams, they can simply look at the material being covered and teach to that. So, with the standardized test you can mold the desired curriculum of your area schools. Along the same lines, the school systems can use test scores to locate areas where improvement might be needed. Certain schools might be lacking in one area while other schools are excelling in another. School administrators and teachers can take this information and address any issues accordingly and help the students learn the knowledge they need for future success. One final benefit and another way these standardized tests particularly prepare students for future success is the formatting and challenging nature of the exam itself. Preparing for and taking the advanced exams prepares students for the next level, particularly when looking at high school students taking exams to get into college where they will be constantly tested on an advanced level. Although many people disagree with the use of standardized tests as the desire to be creative and unique surfaces more and more, the exams have many benefits that are proven and can’t be argued. Instead of stifling creativity, these tests are designed to give schools the best way to prepare students for future success. College preparation can be a stressful time for high schoolers and one of the first big hurdles they must face is the dreaded standardized test. To optimize your potential as you prepare to take the test, you’ll have to decide which exam to go with, the SAT or ACT. The first question you might ask is which one is easier. Unfortunately, the answer to that isn’t a simple one word answer. Factor 1: How Much Should Math Impact Your Overall Score? It seems there are two types of people, those whose excel in math and those who don’t. Most people can tell you if math is their strong suit or not. This will be key in deciding which exam to take because it can drastically impact your overall percentile. The ACT measures your math score equally with the other three sections. So it equals one quarter of your composite score. On the SAT, however, the math section equals half of the composite score as it is measured as only one of two separate sections in your overall composite score. Therefore, a lower math score might not necessarily bring your percentile down too far in the ACT if your score high on all the other sections. But a lower math score on the SAT will have a very large impact on where you rank. Factor 2: Do You Need a Calculator? While all of the math questions on the SAT and ACT are designed to be solvable without a calculator, they are certainly meant to challenge you, and both allow the use of a calculator if you need one. However, the SAT does contain a no-calculator sub-section within the math portion. For 55 minutes, you’ll be allowed to use a calculator to answer 38 questions, then you’ll have 25 minutes to answer 20 questions without a calculator. The ACT doesn’t have a portion like this and you’re allowed to use a calculator throughout the whole math portion. Factor 3: Are You More Comfortable With Trig or Data Analysis Type Questions? That’s right. Another math-based factor to consider as you’ll realize the math section of the ACT and SAT to be a very influential portion of your score. So another factor to consider is the type of questions you’ll face in each math section. The ACT focuses on a very broad spectrum of math including more trigonometry and geometry questions as well as logarithms and graphs while the SAT is more focused on algebra with some data analysis type questions mixed in. Although we’ve seen most of the more challenging aspects in the math section to be with the SAT, one of the biggest challenges to consider with the ACT is the fact that it doesn’t include the formulas you’ll need like the SAT does. That means you’ll need to have all of the formulas you may think you’ll need memorized beforehand. Factor 4: How Much Time Do You Need For Each Question? Taking a break from focusing solely on the math portion of the exams, one factor to consider for the overall test is how much time you made need to answer each question. While some test-takers are good at narrowing down multiple-choice questions pretty quickly and not second-guessing, others may like to have longer to analyze the answers more thoroughly. If you fall into the latter category, you might consider taking the SAT since it offers more time per question than the ACT in each section with the math providing the largest difference at almost 30 seconds more per question. Factor 5: How Strong is Your Science Knowledge? If you like science, the ACT might be right for you since it’s the only one to have a specific section designated for science. While the SAT incorporates some scientific concepts throughout the other sections like reading and math, the ACT actually has 40 questions to test a broad scientific knowledge and understanding. Factor 6: Are Associated Reading Questions Okay? The reading sections of the two exams are also a little different and lean toward different strong suits. SAT reading section incorporates logical reasoning skills in sets of questions that build off of each other. So after reading the sample portion and continuing into the questions, the first question might be the “why” question regarding some fact you read. Then the subsequent question would be to pinpoint the section of the reading sample that supports your previous answer. If you prefer more straightforward reading questions, the ACT may be for you. Although the ACT reading questions might be a little straightforward than the SAT, they do jump around more which can throw some test-takers off. In the SAT, questions following a reading passage flow in perfect chronological order based on where they are found in the reading passage. Questions on the ACT are random. Factor 8: Would You Test Better in Grammar or Vocabulary? Each test offers an optional writing portion, which you’ll more than likely take as many schools will want to see it. It doesn’t factor into your overall score but there are some things you should keep in mind as there are key differences between the two. The ACT writing portion focuses more on grammar and sentence structure while the SAT tends to focus more on individual writing style and vocabulary knowledge. Factor 9: Do You Want to Increase Your Odds On Multiple Choice Questions? While both the SAT and ACT are multiple-choice exams that don’t penalize wrong answers, there is a slight advantage to taking the SAT if you want to increase your odds on questions you might need to guess on. Most of the sections on each test contain four answers per question, but the math portion of the ACT actually has five different answers. So if you think you might be guessing a lot in the math section, the SAT will slightly increase your odds of guessing right. Factor 10: Is There A Specific Requirement You Must Meet? Of course all of this research and in-depth study of the differences might be pointless if you have a specific requirement to meet based on your school or state. While the majority of schools will accept either test score, there might be a specific requirement or preferred exam. Also, there are several tests that incorporate one specific test as a requirement. Alabama, Colorado, Hawaii, Kentucky, Louisiana, Minnesota, Mississippi, Missouri, Montana, Nevada, North Carolina, South Carolina, Tennessee, Utah, Wisconsin and Wyoming all use the ACT. Connecticut, Delaware, Idaho, Michigan and New Hampshire all use the SAT. These states usually incorporate a lot of preparation throughout high school specific to that specific exam so you might be better prepared to take the test used by your state. The ACT is a large milestone to cross and adequately preparing for it can ultimately help high schoolers get into the college of their dreams. There are many things you can do and keep in mind as you prepare to enter exam day that could positively affect your score. Obviously the best thing you can do in preparing for exam day is reviewing and studying the topics you’ll be tested on. These include English, Math, Science and Reading. Most of the ACT is designed to test what you should’ve learned in school, so it should be a matter of reviewing and getting as familiar with these subjects as possible. The Math section of the ACT can be daunting as it tests a range of mathematical knowledge including algebra, geometry and trigonometry. Plan to go through the questions as quickly as possible and go back to recheck items you think you might’ve gotten wrong. Spending too much time overthinking a problem can be harmful to the rest of the exam, especially if you get hung up early on since the questions purposefully get harder and more in-depth as this section goes on. Learn to use multiple-choice questions to your advantage as you study. Use logical reasoning to deduce the answer for problems you might not be completely sure of. A final tip to prepare for the Math section is to memorize any formulas you think you might need or might be helpful. There really isn’t too much preparation or secret tricks to the English section as it’s pretty straightforward and tests knowledge you’ve already learned. Although it’s the section with the most questions, it’s usually the one test-takers get through the quickest. Being familiar with basic grammar and sentence structures will help you ace this section. Both of these sections are formatted similarly in that you’ll be given a particular passage or set of experimental data and asked a series of questions pertaining to the reading or data. So a trick to preparing yourself for these sections is to find sample questions and practice a technique where you skim over the passage and questions, then go back to read more carefully in order to locate the answers to your questions within the reading. One of the best tricks to get you prepared for the ACT is actually to relax and make sure you get some rest prior to exam day. Don’t try and have late-night cram sessions, especially the evening before you’re supposed to go take the test. You’ll need to enter the classroom with a clear and calm mind so get your rest and try to relax. The ACT can be intimidating for high school students as they prepare to take the exam which could ultimately determine which undergraduate schools they can get into. Increasing your scores and therefore increasing your chances for the future is the goal for most test-takers. In order to optimize your score and chances, familiarizing yourself with the basics of the ACT is key. Before you go into test day, you should know exactly what subjects you’re facing, the format of the test and how your scores will be determined and interpreted. Obviously one of the first things you should know about the ACT is what subjects you’ll be tested on so that you can study accordingly. The four basic sections of the ACT are English, Math, Reading and Science. There is also an optional writing portion that you’ll probably want to take but it doesn’t factor into the overall score, it’s scored separately. Just as important as being familiar with what’s on the ACT, you should know the format of the exam and exactly what you’ll be facing. Prepare yourself ahead of time by going over the morning’s routine in your mind including the exam room and what time it’ll be held. Make sure you plan to show up early so you’ll be prepared mentally when you sit down and leave room for something that could potentially delay your arrival. The actual exam is designed to be somewhat stressful and test your time-management with short windows to answer large amounts of questions. 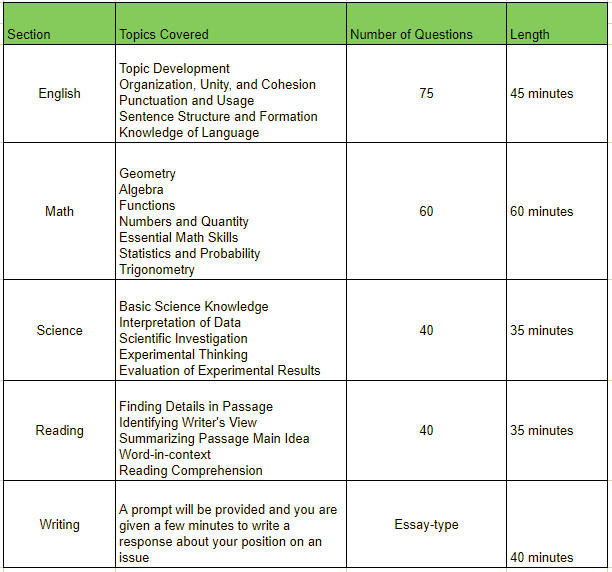 The Math section gives you 60 minutes to answer 60 multiple-choice questions. Both Reading and Science give you 35 minutes to answer 40 challenging questions and the English section gives you only 45 minutes to answer 75 multiple-choice questions. The optional Writing portion allows 40 minutes to complete one solid essay. Keeping these time constraints in mind, it is important to keep moving throughout the exam and not get hung up on a difficult question. That being said, the ACT does not penalize for wrong answers, so it’ll be the same whether you leave it blank or guess incorrectly. Depending on the number of choices (they range from four to five) you have a 20 to 25 percent chance of at least guessing correctly, so it is wise to go back and fill in any of the difficult questions you had to skip before time runs. In short, the ACT is the average of your four individual section scores. Each section is scored on a scale from 1 to 36. So if you add all four of your individual scores, divide by four and round down to the nearest whole number, that is the overall score that you’ll receive and which your potential schools will look at. Of course each of your individual section scores will be available for schools to view and take into consideration. A couple things to keep in mind about the scoring of the exam is the ability to cancel scores and retake the test at a later date. If something went wrong on this particular test day, you can cancel the score altogether. However, this isn’t common since schools generally just look at your highest ACT score and in fact give you the option to send whichever scores you want to them. If you’re going to retake the test, it is usually okay to just retake it without cancelling out your previous test scores. There are very select schools like Yale and Harvard that do require you to send all of your ACT scores so if you plan on applying to these schools and you’re afraid something went wrong, it could be in your best interest to go ahead and cancel the scores. Overall, ACT test preparation can be daunting and preparing yourself ahead of time by researching what you’ll be facing can help alleviate some of that stress and allow you to arrive on test-day with a cool and calm mind. You’ve heard it over and over again: preparation is key. When it comes to a life-altering exam like the SAT or GRE, which could determine the fate of your future education and subsequently, your career, this tip could not be more true. The level of preparation will make or break you when test day arrives. The study materials will only go so far without a detailed plan in how to use them. Write out goals and objectives for each day leading up to the exam. Make sure the plan covers every area included in the exam, this will help keep you from forgetting to study particular topics. Your plan should not just break down study time but detail the exam day itself. Figure out exactly what time you need to leave in order to get to the exam early and give yourself plenty of buffer room in case something happens. Make sure you’ve gone over the test requirements over and over again to familiarize yourself with the time and location so you know exactly when and where to be. If you’ve never been there, it might be worth taking a trip the day before to make sure you can find the room. Whatever you do leading up to the big test day, organization is going to be key to being successful and maintaining your sanity. A frazzle, unorganized brain will affect your test score and can be avoided by simply gathering the required materials and setting up a detailed plan as discussed here.